The Illusionist is along the lines of a similar themed movie entitled "The Prestige" which also revolves around mystery, intrigue, romance and the unknown world of the supernatural. The tale of the Illusionist revolves around an illustrious stage magician called Eisenheim (Edward Norton) who lost his first love as a child. Unbeknown to Eisenheim, he once again encounters his first love Sophie von Teschen (Jessica Biel) who is soon to be betrothed to Crown Prince Leopold (Rufus Sewell). Their love is once again rekindled and when the Crown Prince discovers this union, he vows revenge on not only his fiancé but also on this stage magician who has the ability to summon the dead. With extraordinary acting by Norton and Paul Giamatti as Chief Inspector Uhl, this film features everything you would expect and not to expect in a good mystery which leaves you guessing to the end. oes Eisenheim has supernatural abilities or is he just an ordinary charlatan? It's easy to be engrossed in this extraordinary movie that is a first class cinematic experience. Highly Recommended! 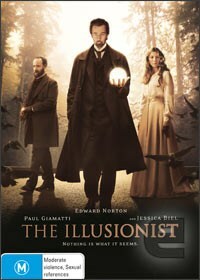 Presented in an aspect ratio of 16:9 enhanced with Dolby Digital 5.1, the Illusionist also features in-depth commentary by writer/director Neil Burger and a small featurette regarding the story behind the Illusionist. The illusionist is one movie that can almost be watched by everyone which leaves you questioning almost everything in the movie and the greatest illusion of Eisenheim's career.